Designed for a modern lifestyle, Ancona's Capri Series top mount double bowl sink will noticeably improve your daily kitchen tasks. This top mount sink features twin 14 inch bowls which provide ample room for all of your needs. Accommodates to most counters and cabinets, the rear drain allows more space below the sink. Constructed in stainless steel with 3-holes for faucet installation, its satin finish and slender curves will enhance any kitchen arrangement, turning it into the captivating center of your home. Capri Series Top Mount Stainless Steel 31.5 inch 3-Hole 50/50 Double Bowl Kitchen Sink Designed for a modern lifestyle, Ancona's Capri Series top mount double bowl sink will noticeably improve your daily kitchen tasks. This top mount sink features twin 14 inch bowls which provide ample room for all of your needs. Accommodates to most counters and cabinets, the rear drain allows more space below the sink. Constructed in stainless steel with 3-holes for faucet installation, its satin finish and slender curves will enhance any kitchen arrangement, turning it into the captivating center of your home. 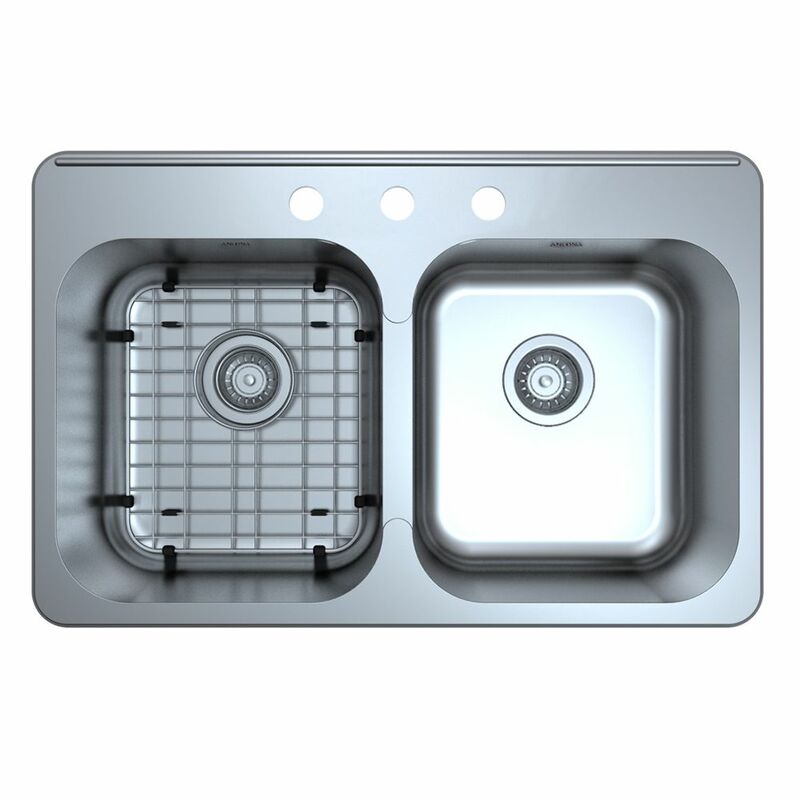 Capri Series Top Mount Stainless Steel 31.5 inch 3-Hole 50/50 Double Bowl Kitchen Sink is rated 5.0 out of 5 by 1.